Welcome to the first edition of In Focus, the flagship digital journal of the European Centre of Technology (ECT)! The ECT has 40 years’ experience of education through knowledge-sharing and best practice in the areas of Engineering, Management, Finance and Computing. In Focus will draw on this experience and provide the main reference point for individuals who are committed to keeping informed of the latest developments in these constantly evolving industries. In Focus will make a crucial contribution to the overall mission of the ECT, which is dedicated to disseminating knowledge between its ever-expanding network of clients, experts and organisations, as well as the wider industry. The related industries of Engineering, Management, Finance and Computing have long needed a quality source of news, debates and cutting-edge developments taking place right now. As these sectors become increasingly competitive, professionals need a point of Focus to remain ahead of the game. In Focus will assist these professionals, providing them with the information they need to progress their career, grow their business, or improve their understanding; as well as support students and individuals who wish to keep pace with the latest innovations as they look to develop within one of these industries. This digital platform will mirror the pace of industry change, by publishing essential content, including articles from industry experts. In Focus launched through the United Nations Environment Programme publication International Special Issue 2016/17, which will be received by major governments and Head of States during upcoming UN Summits. In Focus also works closely with major universities and academics in the UK, USA and across the globe, ensuring that its audience is provided with specialist insight which will support them to operate successfully in their chosen field. In Focus is one more way that the ECT links the industries of Engineering, Management, Finance, Computing, and their professionals, to leading university and organisation research. The ECT has provided a link between industry and academia at an international level for more than 40 years, through biannual conferences and classroom and distance learning training, and this successful networking model has attracted participants from diverse backgrounds, from SMEs to large global organisations such as Deutsche Bank, Coca-Cola and NATO. 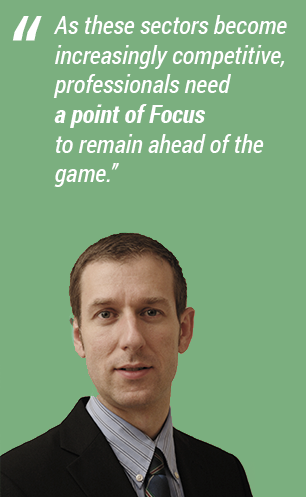 In Focus will continue to attract a diverse audience of individuals with varied experience. The journal will be helpful for industry beginners, who are looking to start out in these exciting fields. It will also ensure that experienced professionals continue to expand their understanding through continuous professional development throughout their careers. All readers will be exposed to crucial information they need to be aware of to succeed in the fields of Engineering, Management, Finance and Computing. We always welcome those who wish to get involved with our work, as our international network continues to expand to more than 127 countries worldwide. This network can be accessed through several platforms which operate, both online and face to face. For example, many professionals and individuals who want to start working in the sector attend classroom courses for education and networking opportunities. We are delighted to be able to provide these experiences and to witness the growth of our Alumni’s careers, which are stimulated by the links we create between academic and practical authorities in these fields and professionals and students operating within the industries.